National Geographic has adopted the term geo-education to describe the in-school and out-of-school learning experiences where students learn about how the world works. A well-rounded geo-education provides young people with the knowledge of how the human and natural worlds work at local, regional and global scales. A geo-education also teaches young people to use different perspectives to understand the world. Geo-education provides learners with a combination of the following understanding, attitudes, and abilities that they will need throughout their lives. Understanding of how our world’s social, physical, and living systems function and interact. Knowledge of specific cultures; political, technological, and economic systems; ecosystems and physical systems. Appreciation for the perspectives of other cultures and for our world’s cultural and natural resources. Ability to communicate and collaborate effectively across cultural and geographic boundaries. Ability to analyze situations using multiple disciplinary perspectives. Ability to reason about consequences of actions. Geo-education is not something that is new. Anyone who helps their students reach these objectives is a geo-educator. 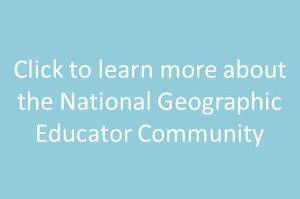 Connect, share, and learn from other geo-educators at National Geographic’s new community for geo-educators. Learn more here. National Geographic has adopted the term geo-education to describe experiences that help young people to understand their world. This slideshow describes the domain and scope of a well-rounded geo-education.